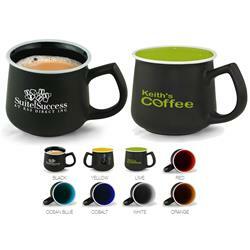 For the custom mug that stands out in a crowd, Le Castor is your mug of choice. 12 oz capacity with an eye grabbing unique design and color options. This is not your $0.99 mug - this is a mug that will grab your eye. Inquire for additional imprint options. A staff favorite! 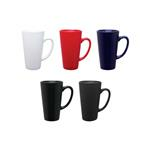 Available Colors: Black exterior, white rim with black, yellow, green, red, ocean blue, cobalt blue, white and orange interior. 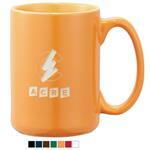 3-tone mug, 12 oz, designer, ceramic.